The $66 billion Bayer-Monsanto merger just got a major green light — but farmers are terrified | "Global Possibilities"
On Monday, the US Department of Justice approved the German pharmaceutical and chemical group’s bid to buy the US seed giant for more than $60 billion, The Wall Street Journal reported. Bayer agreed to sell off additional assets to alleviate anti-trust concerns. With the increasing consolidation of the agriculture supply industry (Monsanto-Bayer is the biggest of three major mergers — preceded by Dow-DuPont and Syngenta-ChemChina), Govier doesn’t expect things to get easier anytime soon. The size of the Bayer-Monsanto deal — it was the biggest merger announced in 2016 after AT&T and Time Warner — means the companies have to seek approval from regulators in 30 countries.Last month, the deal won antitrust approval in the European Union. US approval was expected as well, given that the CEOs of Bayer and Monsanto, Werner Baumann and Hugh Grant, visited President Donald Trump before he took office and said in a statement that the three had a “very productive meeting” at Trump Tower. Baumann and Grant suggested that Trump shared their view of the agriculture industry’s need for innovation. To that end, the companies highlighted their plan to spend $16 billion on research and development worldwide over six years — an average of $2.67 billion a year. Data compiled by the Farmers Business Network, a data-distribution network that collects crowd-sourced information from members, backs up Connelly’s concern. 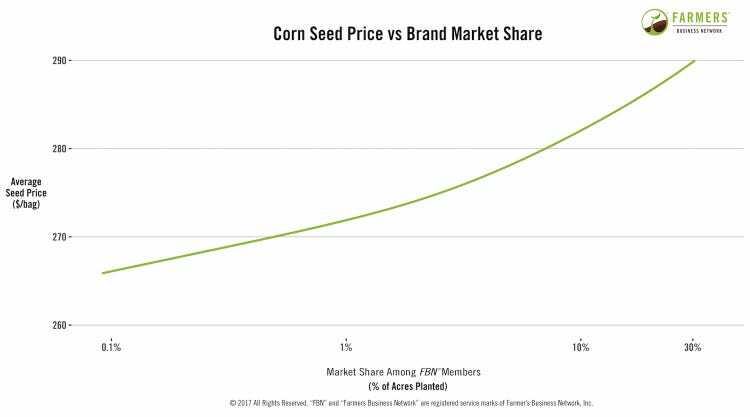 FBN analyzed corn-seed yield (the number of bushels farmers can produce per acre) in relation to the seed brands’ market share, based on data from 5.75 million acres of corn. It found that while greater market share was correlated with higher yield — a primary goal of agricultural innovation — the rise wasn’t proportional. When plotting seed prices in relation to market share, FBN data also showed that greater market dominance was correlated with higher corn seed and chemical prices.That doesn’t bode well for farmers, since the newly consolidated agricultural companies already make up a significant portion of the market, according to Connelly’s analysis. Such consolidation isn’t the only headache for farmers under the Trump administration. Some farm owners who depend on immigrant workers have concerns about Trump’s immigration policies, since they say they can’t find enough American citizens to fill their staffs. Agriculture industry groups also strongly opposed Trump’s trade restrictions on China, since the country is likely to retaliate with high tariffs of its own. “We disagree with this and are convinced the opposite is true,” the company wrote. “We are competing with other very strong companies that offer similar products and have strong R&D capabilities. We will only succeed with pricing and selling our products if our value proposition to our customers is better than that of our competitors and if we continue to innovate. We are also convinced that in a competitive business such as the agriculture industry, the efficiency gains generated by innovation will increase returns for farmers.”Monsanto’s Fraley estimated that, under the current system, it takes about a decade for a company to develop and get approval for a new herbicide. Then if that product is popular, it’ll take the company another 10 years to make a seed trait that responds to the new chemical. But since Bayer and Monsanto’s combined resources might allow them to develop paired products in tandem, he said they could halve the time it takes to bring those new products to farmers. “We’re not going to be chasing the best solution anymore — we’re going to be chasing the good-enough solution,” Connelly said. Todd Eney, a fourth-generation farmer in central Montana, previously told Business Insider that as suppliers of seeds and chemicals have become more consolidated, he hasn’t seen many benefits. Eney’s farm grows wheat, malt barley, and field peas, and it uses Roundup, Monsanto’s popular weed killer. Last year, he said, he and his father decided to use 50% less fertilizer to cut costs. The possibility of further consolidation has him on edge. “You know, it’s almost like you shrug your shoulders and cross your fingers that your regulators are going to have a backbone and not let it happen,” he said last year. That scenario does not seem to be playing out as he’d hoped.